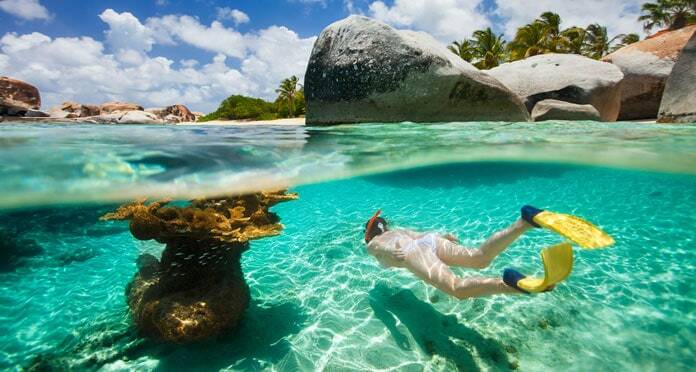 Snorkeling has long ago become one of the top things to do on vacations. More and more people are learning that exploring the streets of a new town is not enough, they want to explore the oceans too. Tropical destinations are one of the most used vacation hubs on the planet and to most, soaking in the warm crystal clear waters is a must. Exploring the life underwater truly never gets old. Never do you tire of seeing sting rays and turtles gracefully soar through the water. 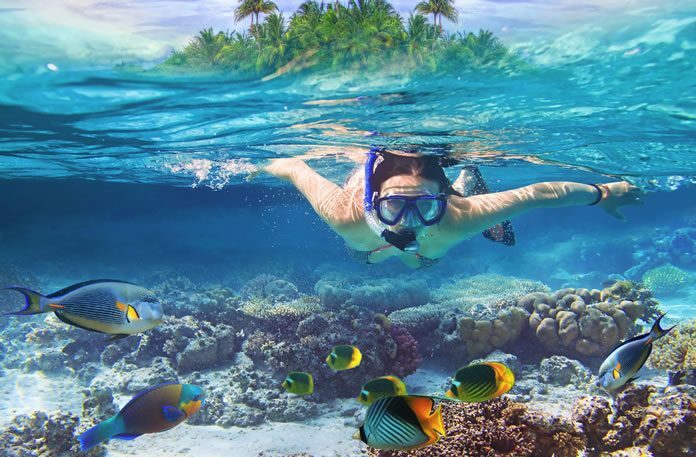 While many water enthusiasts turn to scuba diving as a way to get the full underwater experience almost anyone who has ever tried snorkeling knows just how beautiful and magical it is. The underwater world is full of caves to swim through, reefs to explore, sunken ships full of coral as well as plenty of marine life. With the ever changing climate and the growing pollution leaking into the waterways now is the time to visit these sites. As there are more and more tropical tourist destinations getting talked about every year we thought we would help you plan your next vacation. The best part is, some of these top sights are closer than you ever thought being found right here in the US. While the world is a large place, we have broken it down to find the 10 best snorkeling spots in the world. These spots all have tropical, clear waters that make exploring easy as well as many tropical fish to be discovered. Be sure to get your gear and your camera ready. Starting with one of our more local spots, it is no wonder that the tropical waters of Hawaii are at the top of our list. While the Big Island is only one of the many islands in the area, it is some of the best snorkeling in the world. This could be due to its larger size giving you more great spots but the life underwater is just as stunning as the life above. There is a state park called Kealakekua Bay that is one of the best in the area. Known for its history this area is where Captain James Cook first landed on the island. When exploring underwater you can expect to be met with a plethora of colorful fish and impressive corals. If you head over to where the Captain Cook Monument is located you may even be able to see some larger marine animals. These warm waters are home to dolphins, sea turtles as well as many different stingrays. 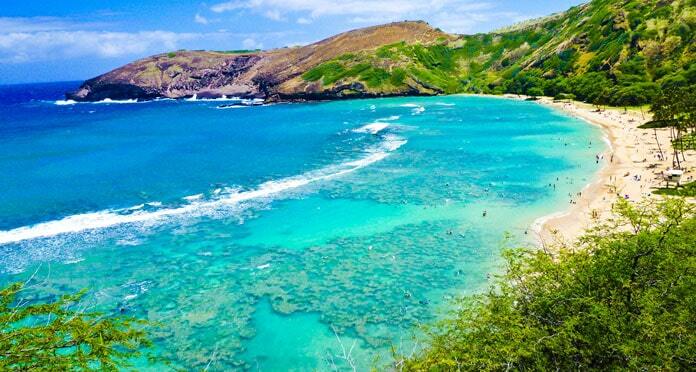 Ensure you have a dry snorkel when heading to Honaunau Bay as you will likely be tempted to dive below the surface. This area is known for its beautiful coral gardens and many tropical fish that call this area home. You will feel as though you are scuba diving as you swim with dolphins and any other large fish you are lucky enough to spot. This group of islands has been one of the best kept secrets. This hidden paradise has exploded in popularity through recent years. Of the 1200 islands that make up the Maldives roughly 200 are inhabited by locals and 100 of which are geared towards tourism. Sitting secluded just south of India surrounded by the warm waters of the Indian Ocean it is no surprise that this area makes for some great snorkeling. Crystal clear water has a new definition in this beautiful area with you able to see down below the water’s surface by standing on dry land. The best time to visit this tropical paradise is between January and April where you will be left with spectacular visibility. There are many atolls to be explored in this area all with their own set of beautiful aquatic animals and fishes to see. Home to about 700 species of fish, plenty of larger marine life such as sharks, turtles, and Octopi as well as a plethora of coral. With lots to be explored in this area and the dreamy accommodations, it is no wonder that this is at the top of our must see snorkeling destinations. This is well-known spot offers some of the best snorkeling in the world and the best dive sites. It features the largest reef in the world which is home to thousands of underwater creatures. You could spend years exploring this place and still not be able to see everything. You can see everything from barracudas to shipwrecks. The reef is made up of 2900 individual reefs and features over 900 islands off the coast of Queensland. It is so large that it can be seen from space! You will be blown away by the colors and sights under the water. Not to mention the fact that the water is a warm 30℃ (86℉) nearly all year-long – no need for a wetsuit in this climate. The reef is a wonder to snorkel through but is also worth taking your experience one step further. Diving in this spot is some of the best in the world. Visibility ranges between 20 – 30 meters (65 – 100 feet) allowing you to see everything around you with ease. 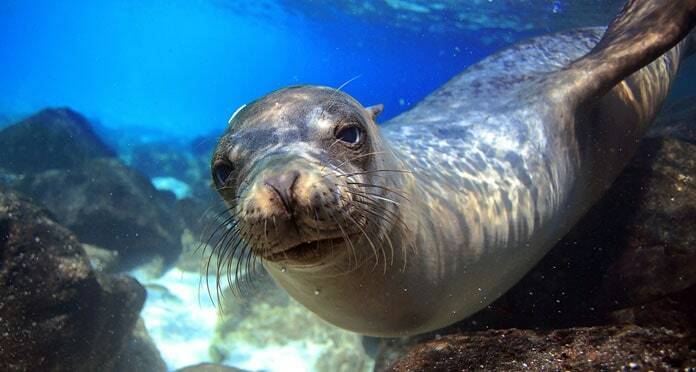 The Galapagos Islands are known to be a tropical paradise full of wildlife that is foreign to most of us. From large Komodo dragons to penguins, there are lots to see here that is unlike anything you have experienced before. This series of islands make up one of the most active volcanic spots in the world. Due to this island’s unique destination, there is an extremely wide variety of marine life in the area. Snorkeling here you expect to see Galapagos penguins, seals, sea lions, humpback whales, orcas, sea turtles and even dolphins. These warm waters are a wonder to be explored. If you want to take your snorkel a step further you can swim in Devil’s Crown. This is a sunken cone of a volcano that can be explored. Here you will see incredibly colorful fish and moray eels. Most people have never heard of Palawan before, but in the diving world, this is a huge name. There are 7,000 islands that make up this piece of the world and each one is worth exploring. While Palawan is just a small cluster of those islands, a quick google images search will show you why this slice of paradise made it to the top of our list. The white sand beaches and tropical temperament will make you never want to leave this relaxing paradise. While the island’s tropical location doesn’t warrant a winter, there is a rainy season from June to October. This time doesn’t make for the best snorkeling as the water is often disturbed. For this reason, a visit in the drier months, between November and May, will make it so there is no Plankton and thus a better visibility of up to 40 meters. If you care to fully explore the island and go a little deeper, this is the place to do it. A great spot for even amateurs to learn to dive here you will never tire of sights to explore. 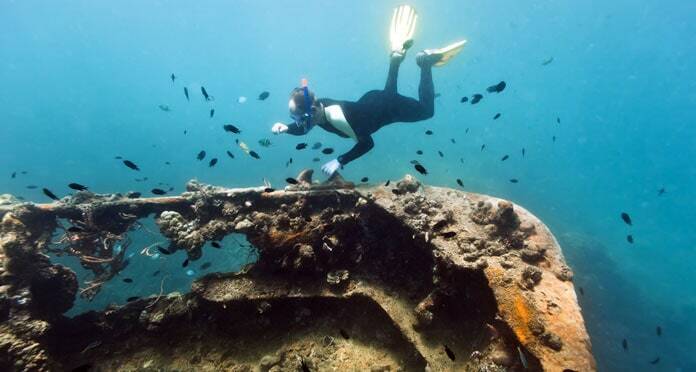 The coastal waters are home to 11 Japanese shipwrecks that are fun to explore. There are also lots of reefs to be explored including the wall that you can expect to see sharks, tuna, mantas, and barracudas. Due to the beautiful calm waters snorkeling here is some of the best you will ever experience. You will be blown away by the wildlife and sites. The water is so clear that it seems like you’re floating on air. Snorkel beside giant sea turtles, and see coral that is vibrant and active. Find your own secluded island and spend your time snorkeling and exploring. Life doesn’t get better than that. Not far from the US in one of the most tourist islands that make up the US Virgin Islands, St. Croix. This island is known for lush green rainforests and crystal clear waters. This area offers lots to be explored both on dry land as well as in the ocean. In this area, you are likely to see many majestic underwater creatures including an octopus hiding in the great blue. There are many coral reefs in this area including the elkhorn coral barrier reef. The water here will shock you with a beautiful blue hue and visibility between 60-100 feet. You will enjoy the warm 80-degree temperatures making this area a true tropical haven. 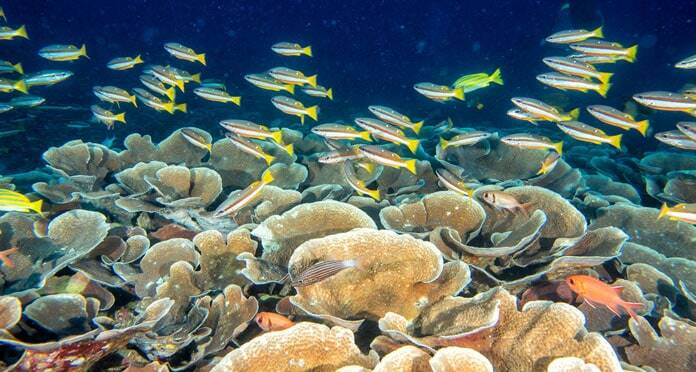 On this reef you can expect to see many colorful fish and corals. The waters here are still and shallow making it a snorkeler’s paradise. There are also three different species of turtles that call this area home making it an exciting adventure to spot these graceful creatures. This island should be at the top of your list. 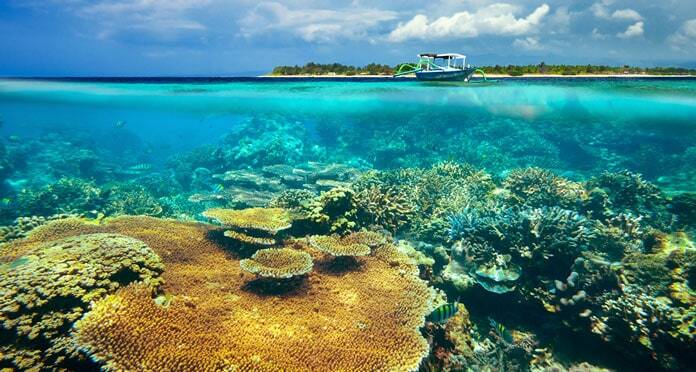 Indonesia is home to many of the world’s top snorkeling and dive sites. From Bali to Komodo Island, you will be blown away. As the island’s name suggests there are many Komodo dragons that inhabit the island which is what draws most of the tourist’s attention. In reality, this area of the world offers so much more. The warm waters in this area are home to over 1000 species of fish, 260 different types of corals as well as whales, dolphins, and turtles. Snorkeling at Pink Beach you will find many rays, groupers, and turtles that live in the beautiful gardens under the sea. Komodo National Park is yet another beautiful area to explore. The waters here provide the most exciting of exploration as you find yourself swimming with sharks through a reef that is so shockingly full of life you won’t believe your eyes. Make sure you have the best snorkeling mask before heading here, you won’t want to miss a thing. 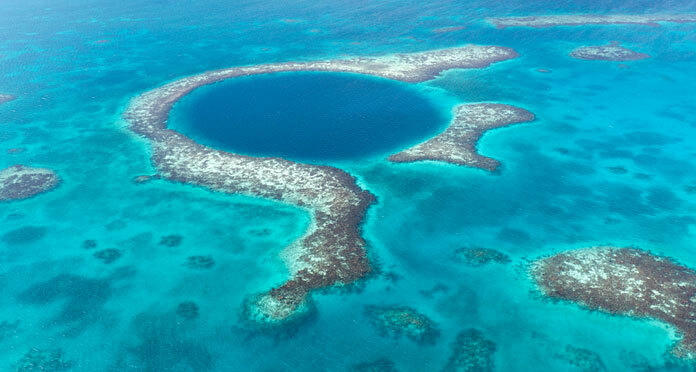 Belize is known by divers and snorkelers as having some of the absolute best sites in the world. 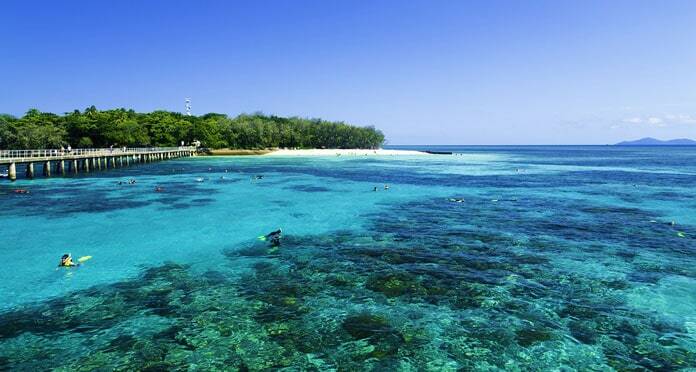 It is home to one of the largest barrier reefs second only to that in Australia. A whopping 185 miles big this reef will take a while to fully explore. That is what makes this one of the best snorkel spots is that there is so much to see. Belize is one of those rare places that you will find yourself face to face with eels and rays. You are sure to be amazed by how many beautiful bright colored tropical fish are found here. With hundreds of small little islands and beautiful ring shaped reefs in this area, you will quickly fall in love with these beautiful Caribbean waters. This is a great area for spotting coral. The reefs are full of color with anemones of all different shades all full of life. The warm turquoise water is great to swim in. Both divers and snorkelers find some of the best waters to be off of Ambergris Caye. Specifically, in Hol Chan Marine Reserve there are many nurse sharks and rays that are a real thrill to swim with. For those that are familiar with Brazil, this hidden paradise is located halfway between São Paolo and Rio de Janeiro. Coming here you will feel as though you are sitting in the middle of a wild jungle with lots of monkeys. While there are hotels here the area feels largely untouched. Not just a great place to visit for what’s above water but this area has a remarkable ocean life as well. The water here is so blue you will find yourself thinking you are in a dream. This combined with all the colorful fish that call this area home will have you thinking you’re in a fairytale. A must see sight is the Blue Lagoon, also known as Lagoza Azul. This is an area where you will experience warm waters flooded with seahorses. In this dive, there are many underwater coves to be explored that sea turtles enjoy hiding in. The underwater looks just as much like a bushy jungle as above water. If you care to dive while here, the coastline is studded with many shipwrecks that are now full of life with coral growing in abundance. These shipwrecks are what is left over from battles between pirates and the Portuguese. Pay no attention to the order as although this may be the last on our list, this is one of the best kept snorkeling secrets. In Palau you will see many a fish including a ton of jellies. 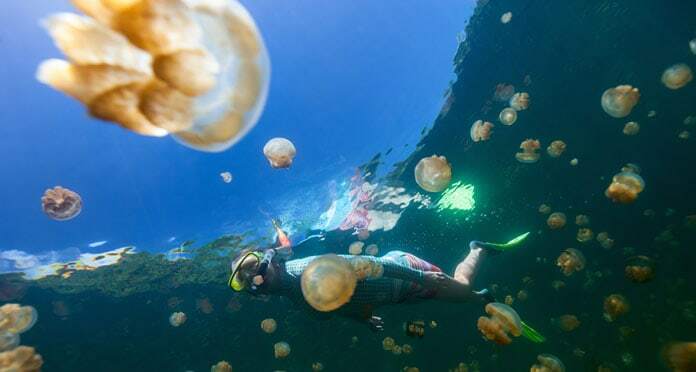 Jellyfish lake is the only lake in Palau that offers snorkeling and is definitely a must see. This island is uninhabited but worth the trek for this snorkeling experience. This lake is full of millions of golden jellyfish. It is amazing to see how these jellyfish have prospered in this lake for hundreds, maybe thousands, of years. These jellyfish are unlike the ones you are used to in the ocean as their sting is not poisonous. Instead, these jellyfish thrive off of eating algae rather than being carnivores. Instead, you will likely not even notice their light stings making snorkeling here unlike anywhere else in the world. The world is a very large place and if you include all the water it is even larger. Almost three quarters of the earth is covered by water, most of it being largely unexplored. It is because of this that more and more people are furthering their exploration to under the sea. With such a vast area there is so much to explore. The coral and the types of fish you see underwater are not guaranteed nor are they the same between the places you will visit. While Hawaii may not have as much color as Brazil, you stand a good chance at swimming alongside a giant sea turtle. When you book your next snorkeling vacation, you will want to make sure you come prepared just as if you were booking a dive holiday. Many times the places you go will only sell cheap snorkel kits that will let in water, fog up or even malfunction. Most of the time these won’t come with a warranty either. It will save you a lot of stress and money to hunt for the best snorkel and mask combination before you go. You may want to consider getting a pair of fins too as this will help you kick through the water and make sure you don’t tire without seeing all the sights. Going prepared to your next holiday will make it so that you don’t have to wait to jump in the water. Have you visited any of these top snorkel destinations? If so, tell us how you liked it in the comment section below.